Being that half of our readers are in the architectural industry I wanted to share some of our pictures from the week in Japan for the BIMcloud® launch event. We also have some additional notes from the presentations and interesting sidebars to share. For the most part nobody really knew for sure what the Hungarian BIM software developer had in mind but one thing seemed unanimous: they were going all out for this event. At the time, it may have been a bit hard for its US and UK press group to get the point of all that effort, but after two weeks back home in Boston it all makes additional sense when looking at the global picture. 01 – Top 10 World Economies. Japan is the world’s second largest CAD market and will likely remain so even though China overtook Japan in 2010 in GDP. At some point in the trip Viktor Varkonyi, CEO of GRAPHISOFT, noted that Japan’s AEC market is dominated by five corporate giants. Of those five giants four of them are firmly behind ArchiCAD as their BIM strategy. And of those five AEC giants, they control over 80 percent of all the AEC expenditure in Japan. It was also noted that BIM adoption in Japan lags the US, UK and some European countries, but that its largest companies have all outlined their aggressive BIM adoption roadmaps. The way BIM will grow in Japan is from the giants out. That’s the reality and the key take-away. In 2002, the US’s economy was $11.0 trillion USD. Next was Japan at $4.0 trillion. And then Germany at $2.0 trillion. If you play with the interactive chart mentioned above, notice what happens over time. Scrub through the years and notice the movement of the key players. While some of these countries’ economies equate to excellent opportunities for software firms others do not. China has a troubling piracy and intellectual property problem. Nikken Sekkei, one of the giants in Japan’s AEC market is establishing presence and expertise throughout Asia and in Russia. GRAPHISOFT’s top-down approach with gaining the trust and clientele of the AEC industry’s biggest customers in Asia may greatly mitigate many of the problems associated with selling software in China. Also of interest in the world’s largest economies is keeping eyes on Russia and Brasil. These two economies combined will have roughly the same size as Japan. Of course a country’s economy cannot be related to a CAD industry economy in a one-to-one ratio. Still, both Brasil and Russia seem like attractive markets for GRAPHISOFT. The company already has a branch office in Brasil. Could Russia be next? 03 – Tokyo BIMCloud architectural tour, interactive guide for press, by Graphisoft. 04 – Lidabashi Station tower, 30 stories high with a very nice facade. Nikken Sekkei architects. 05 – On the roof top of Lidabashi Station tower. CAD journalists check out the skyline beyond. 06 – The scale of Tokyo is enormous…truly vast. Another remarkable structure we visited was across town to the Jinbocho Theater, designed by Mr. Tomohiko Yamanashi (Yamanashi-san) of Nikken Sekkei. This structure is a very innovative performance theater space. Actually a set of spaces as it contains a 100-seat cinema plus a 126 seat play theater. The exterior is made of steel plates (see pictures 07-08) that creatively envelop a structure of glass. Its shape was determined by building out to the maximum allowed volume for the lot. In Japan due to its tight urban conditions zoning rules contain something called “planning height control planes” that ensure adequate sunlight for neighboring structures and plots. These planes may slant. 08 – Steel plates create both the wall planes and roof planes of this innovative theater structure. Nikken Sekkei, Architect. After seeing the Jinbocho Theater we got back on the bus and zoomed over to the upscale Minami-Aoyama district. In this area high-end luxury brands compete for the attention of well-healed consumers with architectural showcases while unique restaurants offer additional environmental attraction. 09 – TOD’S by Toyo Ito & Associates. Ito was the 2013 Pritzker Prize winner. 10 – Taking a picture of the Prada building. Herzog & de Meuron, architects. 11 – A close-up of the facade at the entrance to the Prada building. 12 – INTERSECT by LEXUS by Masamichi Katayama of the firm Wonderwall, in Tokyo. 13 – Another shot of the interior of the LEXUS branded experience building. A wall of car parts in a white painted collage formed a backdrop. 14 – Though not officially on our tour this interesting BOSS brand store featured curved (bent) vertical struts of cast concrete intermixed with glass curtain wall. The INTERSECT BY LEXUS building was designed by famed Tokyo designer Masamichi Katayama of Wonderwall. An article in the New York Times discusses his early work and design aesthetic. The LEXUS building aims to recreate the design ethos of the Lexus car brand in a building environment that mixes a club with a bar and restaurant. There is also a space for a Lexus car, in an interactive and engaging gallery. 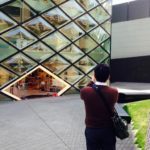 http://t.co/Qr4njNRXZB – Travel pics Graphisoft Japan BIMcloud trip…architecture galore! David Silverman liked this on Facebook. James Badcock liked this on Facebook. Shoegnome, LLC liked this on Facebook.